Well, it worked. 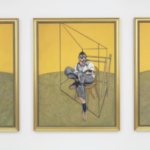 Christie’s set out to achieve a record for Contemporary art with Francis Bacon’s Three Studies of Lucian Freud and they wound up setting the overall record for a work of art at auction at $142m. The bidding was strong with three players still in the game above $120m. One was bidding through a telephone manned by a Chinese-speaking Christie’s employee but the ultimate winner at $127m before fees turned out to be Acquavella Galleries bidding on behalf of a client. Just as with last week’s top lot, the Giacometti bust of Diego, Acquavella won the week even before it was over. When the bidding finally stopped, after more than 10 fraught minutes, the capacity crowd in the salesroom burst into applause. Two disappointed bidders could be seen leaving the room. “I went to $101 million but it hardly mattered,” said Larry Gagosian, the super-dealer who was trying to buy the painting on behalf of a client. Another contender was Hong Gyu Shin, the director of the Shin Gallery on Grand Street in Manhattan, who said he was bidding for himself.